GROWING PRESENCE. 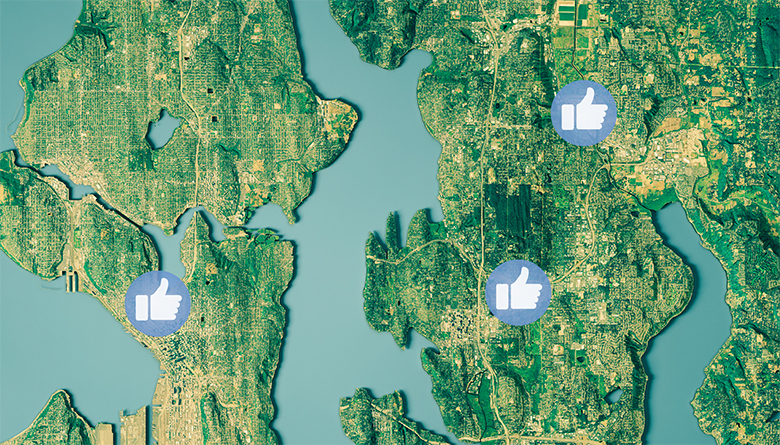 Facebook continues to expand its footprint in the greater Seattle area, where it now employs several thousand people . Vijaye Raji recalls visiting Facebook Inc.’s small Seattle office near Pike Place Market for the first time at the suggestion of a recruiter. Raji, who is now the social media giant’s vice president of engineering and a leader in the Seattle office, was then a principal software-design engineer for Microsoft Corp. He remembers a large disco ball and music blaring through the small office. Only a handful of employees worked in Seattle. Eight years later, Facebook is growing its presence across the Puget Sound region at a staggering pace, making Seattle essentially the company’s second headquarters, or HQ2. The company employs more than 3,000 people in the region across several buildings after adding about 1,000 employees last year, including in Amazon Inc.’s South Lake Union neighborhood, Bellevue and in Redmond, just a few miles away from Microsoft’s campus. The region is already home to Facebook’s largest engineering center outside its Menlo Park, California, headquarters. If all its rumored plans come to fruition, the company could soon occupy the fourth-largest amount of office space in the Puget Sound region with almost 4 million square feet, trailing only Microsoft, which has about 15 million square feet of office space and labs; Amazon Inc., which occupies an estimated 13.5 million square feet of space; and The Boeing Co., according to The Registry, which tracks commercial development in the Puget Sound region. Facebook’s expansion strategy is straight out of Google’s playbook, says Michael Schutzler, CEO of the Washington Technology Industry Association, a trade group. He says former Google CEO Eric Schmidt’s plan more than a decade ago was to build a facility near Microsoft, poach Microsoft’s talent and compete head to head with the software giant. Google, which is headquartered in Mountain View, California, is now preparing to move into a massive 930,000-square-foot building near Amazon’s headquarters in South Lake Union that is still under construction. Schutzler notes that “nearly 100” technology-oriented companies headquartered outside of Washington state — including Apple Inc., Oracle Corp. and Alibaba Group — have opened engineering centers in the region to take advantage of the tech talent here. According to commercial brokerage firm CBRE, Seattle’s high-tech job base has skyrocketed 26 percent during the past five years alone. Tech firms headquartered in Seattle and the San Francisco Bay area snapped up some 12.5 million square feet of office space in the region in that time. Facebook, which opened its first office in Seattle in 2010, now occupies about 1.3 million square feet of office space in the city, according to commercial brokerage Collier’s International, and is rumored to have signed leases for another 1.1 million square feet. The company’s Eastside ambitions also are immense. It occupies about 133,000 square feet of space in Bellevue, and recently signed a 13-year lease for 338,000 square feet of space in an 11-story building in Bellevue’s Spring District, according to a reports by commercial brokerage firm Kidder Mathews. The ambitious 36-acre, 16-block Spring District project will be built around a future light rail station slated to open in four years. It also will house outdoor-gear retailer REI’s new headquarters and the Global Innovation Exchange, a unique education partnership between the University of Washington, Microsoft and Tsinghua University in China. $2 billion soon after Oculus released a development prototype of its virtual reality glasses. Facebook reorganized Oculus last fall and clearly has big plans as it works to introduce virtual reality to new audiences. Facebook CEO Mark Zuckerberg said 18 months ago at Oculus’ Connect Conference that he had the audacious goal to grow the company’s virtual reality division to more than 1 billion users. To support that expansion the company is making a major hiring push. In late February, Facebook had 219 open positions on its Seattle careers page. Oculus had 189 open positions, including about 80 for software engineers. Besides the economic benefits of Facebook’s expansion and the region’s thriving tech scene in general, Schutzler identifies one more positive attribute: connection to community. Companies and employees that establish deep roots here increasingly become involved in everything from schools to nonprofits. “Facebook’s expansion here will increase their investment into Washington state public policy and community engagement,” he says. For Raji, Facebook remains a place of innovation and experimentation. He says the company stresses an organic team-based approach and gives employees the autonomy to set their own goals. Raji works on games, while other teams toil on a wide range of projects, including chat applications, virtual and augmented reality, advertising and marketplace platforms, and the infrastructure that stores Facebook’s range of digital services. About a quarter of Facebook’s engineers in the Seattle area work on the company’s massive cloud infrastructure, supporting much of the data that must be stored. It seems as if that will continue well into the future. U.S. Offices: Atlanta; Austin, Texas; Boston; Chicago; Dallas; Denver; Detroit; Los Angeles; Menlo Park, California; Miami; New York; Seattle; Washington, D.C.
Facebook: Enables people to communicate with each other on mobile devices and personal computers. Instagram: A community for sharing photos, videos and messages. WhatsApp: Secure messaging app for private communication. Oculus: Allows people to connect through Oculus virtual reality products. Source: Facebook. Data current as of Dec. 31, 2018.